6145 people currently visiting GDNet. 1960 articles in the reference section. 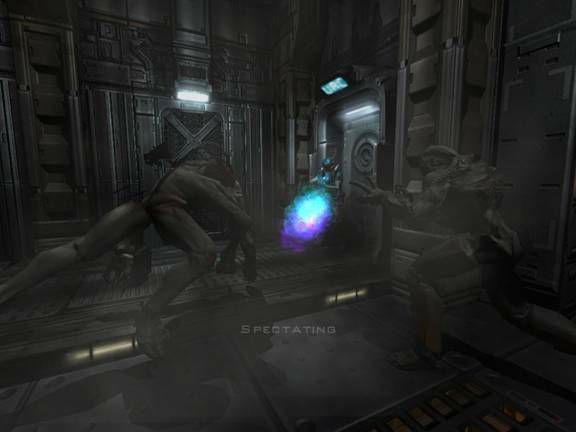 Oli Wilkinson catches up with the team behind the exciting Doom 3 mod, "Last Man Standing" . Can you please introduce yourselves and talk about your roles within the team? MercyKiller: I'm Stephen "MercyKiller" Youts – level designer. My main role on the team is not only designing and implementing levels but also the creating the required art assets (models, in my case and scripting level events. However, we are a small team and thus all do odd jobs from time to time. I'm sixteen years old and live in Houston , Texas . AO: I'm Arne Olav Hallingstad - a coder. Being a student so passionate about game programming I looked around for a Doom 3 mod to join back in December 2004. It had to be a Doom 3 mod (since I love the engine), and be a mod that caught my interest. LMS Co-op was perfect since they were in need of a programmer to implement cooperative play, a major part of the mod. I saw it as an interesting challenge and joined the team. BurN: My name is Balal Aizaz but my homies know me as 'BurN'. I'm 18 and live in the USA . I'm the webmaster for Last Man Standing and somewhat graphics designer as well. Although I intentionally signed up as a webmaster I always find myself doing unique and creative things for LMS. Calimer: My name is Michael Tomaino, though in the internet world I'm referred to as calimer. I'm 25 and I live in upstate New York. My primary jobs are project leader, public relations, mapping and scripting. Overall though my main job is to make sure things get done and that the mod is progressing smoothly. If for some reason an area is lacking, it is my job to help in that area, even if it is not a job I'm accustomed to. Hobbes: My name is Tom Tirone. The LMS mod was quite advanced when I joined the team. I started out modifying the Doom3 maps for cooperative play but then advanced to be a coder. LMS is my first experience in modding. What made you enter the IGF mod competition? MercyKiller: Entering the IGF competition was originally calimer's idea, and we were all pretty cool with it and jumped onboard. BurN: Like Mercykiller said, it was calimer's idea. He mentioned it to the team and we unanimously agreed. The next thing I knew we split the entry fee and were announced finalists. It was also due to the fact that Calimer is so dedicated to LMS that he thought without a doubt we could win the competition, that's what helped me to agree to the idea. Calimer: Actually I can't take the credit for it being my idea; AO noticed it on the Moddb.com webpage and referred me to it. We had been hoping for a competition for a while, I had even sent an e-mail to Id Software suggesting the idea, so this was a perfect opportunity. The reason we wanted a competition so badly is that we wanted to be able to fully demonstrate all of our hard work and effort that we had put into the mod. So when I heard about the IGF competition I saw this as our opportunity and got to work on making it happen. The mod category is a new addition to the IGF competition this year; your mod is a finalist in the Doom3 mod section - how does this make you feel? MercyKiller: I'm amazed at how far we've come through the 1.5 odd years of development. We've traditionally had a good run of garnering interest via magazines and interviews, but being an IGF finalist tops it all. It's been really great working with the guys and I'm extremely proud of how LMS has turned out. Calimer: It is an awesome feeling to have our mod as a finalist! As I said earlier we were hoping for any kind of competition, and to be a finalist in such a big competition is a dream come true, and really a testament to all of the effort we put into the mod. Hobbes: I am very excited about being named a finalist in the competition. I am proud of the entire team and the work we have accomplished over the past year. "Last Man Standing" is competing against only one other candidate, do you think that it's an omen when you consider your game's name? MercyKiller : I'm confident that we'd be the "Last Man Standing" regardless of how many competitors would be arrayed against us. Though we'll probably be given a run for our money, considering that any mod that makes it to IGF finalist has to be good. BurN: Last Man Standing is in no way meant to be an aggressive or maniacal mod name, its just mere coincidence. And the rumors of the team members being taken over by demons have no evidence backing it. That being said, the other mod is going down! Calimer: This is certainly an interesting question and not one that I had ever imagined I'd be asked, ever. I don't know if it is an omen or not but it certainly would be a blast to play some LMS vs the other team and see who could come out as the Last Man Standing! The fact that this is the first year the IGF has run a competition for mods is pretty groundbreaking; do you feel that the game industry is now starting to recognize mods as top-quality games in their own right? MercyKiller: In my opinion, mods have always played a huge part in the success of the base game, at least when longevity is concerned. For example, Half-Life was a great game, but owed much of its staying power to the mods. However, there are many different categories of mods and the industry is recognizing those that either add a significant new feature, or change a large chunk of the content most. Mods are definitely becoming more independent, bolder, and more visible than they were traditionally; contests such as "Make Something Unreal" are the most obvious forms of the industry recognizing mod developers. Calimer: I'm not sure if they are recognizing mods as top-quality games, but I think they are definitely starting to see the importance of modding. Mod have a lot more room to be creative since they are generally created by volunteers and have much more freedom since they aren't bound by deadlines or financial constraints. Also the content base that modders get to work from is quite extensive which means that the focus can immediately be on getting gameplay in game, as opposed to having to start from scratch. Tell me about "Last Man Standing", what is it all about? MercyKiller: Well, the original idea was to bring back the feel of the classic Dooms to the game, with swarms of monsters assaulting the player. Co-op is an integral feature to this concept, as we originally intended to limit the players to only one life, leaving the Last Man Standing the winner. Obviously, the concept has shifted a bit to encompass more general gameplay, though the emphasis is still on cooperative gameplay against insurmountable odds. Calimer: To me Last Man Standing is all about having fun gameplay, and to bring to Doom 3 some elements that I felt were missing. Originally this included levels that featured survival type gameplay against swarms of assaulting monsters. We had levels where you would progress, defend, or were stuck in a small room trying to take down as many monsters as you could and outlast the other marines. 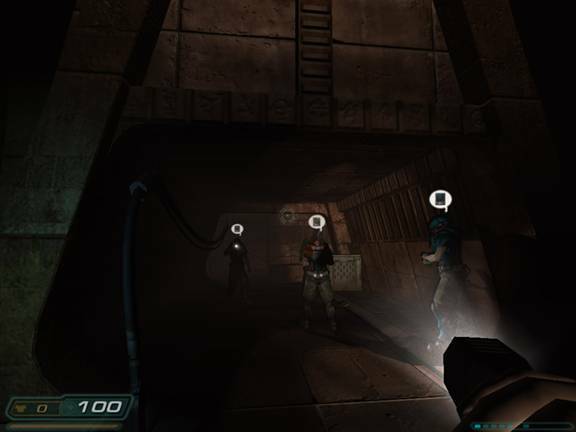 Cooperative support was essential to this gametype and due to popular demand we added coop support to other areas of Doom 3, such as the single player levels, the expansion pack, and the Classic Doom for Doom 3 project. Calimer: The idea was created by Scott Penner and I. We had wanted to create a mod for a while and had been coming up with a lot of complex ideas. I suggested that since the ideas were so complex that we start small and work our way up and that's when we came up with the idea for LMS. A lot of the inspiration came from classic doom and the custom Starcraft maps where you have to defend against swarms of monsters. So as can be seen, a "simple" concept certainly ended up being a lot more complicated than we realized. 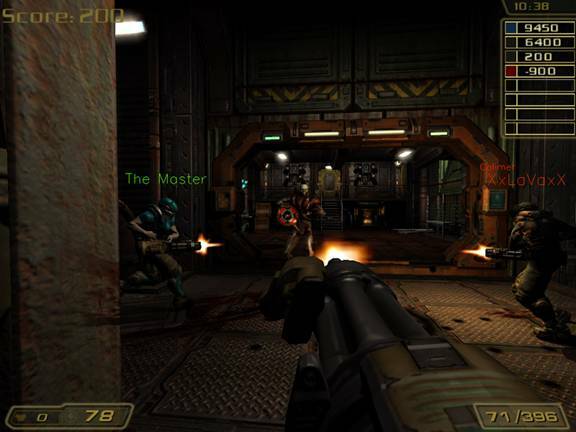 How does LMS differ to regular Doom 3 multiplayer? MercyKiller: Well, regular Doom 3 multiplayer was a rather limited form of deathmatch with some minor variations such as tournament play. LMS is 100% about cooperative gameplay. The biggest feature Doom3 lacked multiplayer-wise was coop and LMS fills this void. Naturally all the original Doom3 and RoE levels are supported in our coop game mode, in addition to LMS Mod and now CDoom Coop. Calimer: It really is completely different from deathmatch since players work together rather than try to kill each other. Key differences are cooperative support, monsters (6+ which are new! ), new weapons, new music, new sounds, tons of new maps and maptypes, infrared vision, new server admin options, a LMS specific scoreboard, and lots more! Who is your target audience with LMS? MercyKiller: The majority of LMS players are old Doom veterans who crave more of that gameplay style. However anyone who enjoys multiplayer teamplay will probably like LMS. First Person Shooter games are all about the guns and action, what does LMS add to this to differentiate from the crowd? MercyKiller: I wouldn't say we "add" a whole lot to differentiate us, per se. 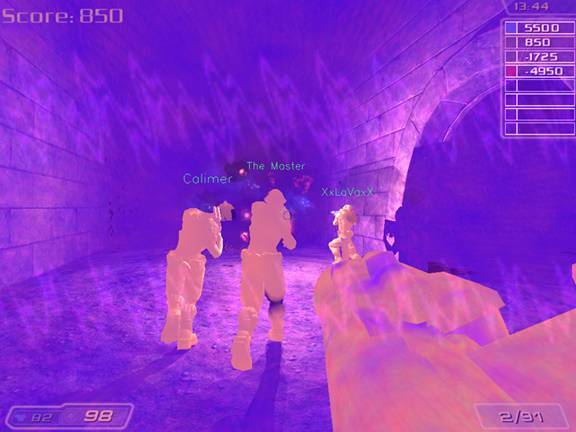 However, FPS games seem to be evolving along an increasingly realism-bent trend. LMS is a throwback to the old, simple days of Doom. I guess LMS is similar to Painkiller in that regard. We're concerned with action-packed and fun gameplay, not with anally retentive realism detail. BurN: We just took Doom=MC� and added Coop to it. Just the fact that you can play with your friends online and try to defend off hordes of monsters gives LMS that extra thrill. We also have different modes of Coop, like single player coop and LMS coop. So having a variety of modes to play online with friends has helped to keep people interested. Calimer: I would say the biggest thing that is different about our mod is the sheer amount of gametypes and maptypes there are to play. If you want a lot of fast paced action than you can play LMS Mod, which has a lot of different gameplay types on its own. If you like the single player levels, then you can play them coop, or even play the expansion pack coop. Not even the Xbox version of the expansion supports cooperative play. And if that isn't enough, in our newest version you can play the Classic Doom For Doom 3 Mod cooperatively. There are so many different things to play in LMS that I really think it can suit just about anyone's FPS needs. LMS sounds like a real departure from the regular Doom3 experience; your game is fast paced compared to Doom3 which was slow and broody - was this intentional? MercyKiller: The ultra-fast tempo of LMS one of the core concepts driving the mod. Calimer: It definitely was intentional as I thought the gameplay in Doom 3 was too slow paced. I wanted to bring back the classic doom experience and add some of my own personal favorite gameplay elements. One aspect that particularly appeals to me is the co-operative Defense maps; are there times where you stand back to back with your team-mates screaming in terror as you let loose your chainguns against the hoardes of hell? MercyKiller: That sort of gameplay isn't restricted to defense maps, though it is emphasized more due to their layout. In my opinion, nothing is more fun than getting pinned against a wall and saving your friends' collective posteriors. Calimer: Oh yes definitely. That is a gameplay element that I've tried to encourage in the other map types as well. It is certainly something I have strived hard to achieve in my defense maps, which is the maptype that has been my main mapping focus throughout the mod. Tell me more about the new gameplay types you've added with your game... How do they differ to other mods? 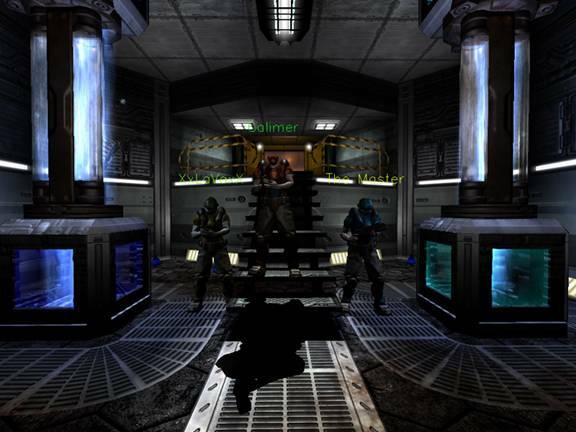 MercyKiller: LMS Mod is the swarm-based gametype, and CDoom coop is an integration of the Classic Doom 3 mod into LMS. Doom3 and RoE coop are very similar to the vanilla game, except for the addition of more players. Calimer: In LMS Mod the maptypes are Progressive, Defense, and Killfest. In Progressive maps you progress through areas in a map. In Defense, you are defending a certain point, VIP, or outpost. Killfest maps feature a small room filled with monsters where players try to outscore other players and see how long they can keep from dying. Defense in particular is a gametype/maptype that I've tried to push since I don't think many other mods or games feature it. And as Mercykiller mentioned, we have SP Coop, ROE Coop and Cdoom Coop for our other gametypes. It is worth mentioning again that only through LMS can you play ROE Coop, not even the Xbox version has this feature. Have you added/removed any weapons to the game to make it more suitable for what you were trying to acheive? MercyKiller: The only weapon we've removed is the BFG, mainly due to its overpowering nature in coop. We've added our own Super Shotgun, along with some other fun weapons such as the Plasmathrower. Most weapons were modified to deal with a greater number of monsters more effectively. 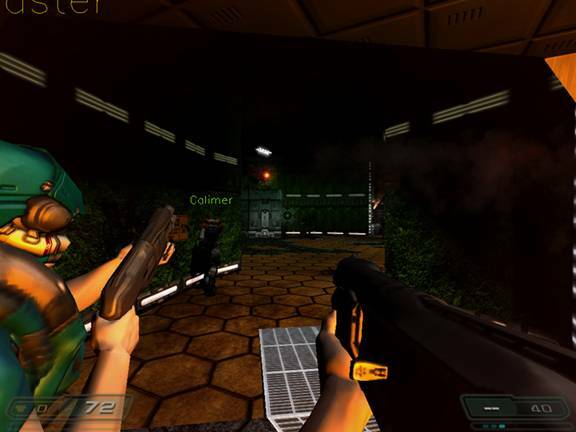 Calimer: Also we added the plasmasniper J My favorite addition definitely has to be the double barrel shotgun as it was my weapon of choice in classic doom, and I was very unhappy when I found out it wasn't in Doom 3. The plasmathrower is fun too since you can it actually ignite monsters and see their bodies collapse under the flames. Have you altered the graphics used in the Doom 3 and ROE expansion packs? AO: We have updated the HUD, main menu and in-game menu to our own theme. We also have a few new player model skins so people get a bit more variety in how their fellow players look. Aside from that I can't think of any other graphical changes worth mentioning, the goal was never to create a total conversion. MercyKiller: We've got some custom graphical content, but for the most part we've stuck with the stock Doom3 themes. One thing that stands out about LMS is how 'light' it all is compared to the original Doom 3; what made you decide to do this? 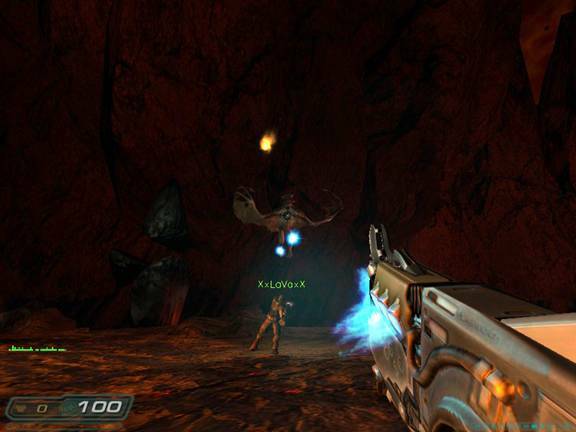 MercyKiller: For the most part Doom3's darkness contributed to its slow pace. LMS levels are brighter to allow better visibility and thus a generally smoother flow. There are exceptions, of course. Chambers of Misery and Labyrinth come to mind. Calimer: Making things "dark" was not really something that needed to be a part of our mod. The mod is more about fast paced action and inciting panic in the players by having hordes of demons running after them to tear out their throats as opposed to a lone zombie jumping out of the darkness. How about sound, what have you done to change them to fit your game? MercyKiller: We've had the pleasure of working with some fantastic bands on music for the mod. Mostly intense metal/industrial stuff to get the adrenaline flowing. Calimer: There has been a lot done in terms of sound because the majority of the levels are accompanied by a heavy metal soundtrack. Also we have a custom made theme song for our menu. The goal was to have the heavy metal music help get the adrenaline pumping to its max as the players are battling off the hordes. We also do have some custom sounds for our new weapons, including the classic doom DB sounds that we were given permission to use from Idsoftware. What tools and technologies have you used in the development of LMS? AO: We use Subversion as the repository for all mod related assets and code. It's a really great tool and makes us work together more efficiently. Both me and Hobbes, our other programmer, have used VS .NET 2003 as the development platform. MercyKiller: Doom3Radiant is the tool I use for constructing levels. My models have been done in Blender3D, and my textures in the GIMP. I've used a wide variety of text editors - everything from ConTEXT under WinXP to vim or emacs under Gentoo Linux. Text editors are actually pretty useful for certain aspects of level editing as well, such as fixing little problems that Radiant introduces. Calimer: We have really used a lot of tools on various operating systems. For example Hobbes uses PearPC and Xcode to compile the Mac builds, I use scons on Linux to compile the Linux builds, and I have used VS 2005 Express to compile the Windows code. As far as mapping I have used both GtkRadiant and D3Radiant, although unfortunately a lot of the mapping could only be done through D3Radiant. As I became more familiar with the engine, a lot of my mapping started to be done with text editors. Textpad really has been my text editor of choice and I have done lots of LMS editing with it since almost every Doom 3 file can be opened as a text document. Why did you choose to create a mod for an existing engine rather than starting from scratch? MercyKiller: Keep in mind that although the core concept of LMS could easily drive a standalone game, the mod is really about bringing back old school FPS gameplay - gameplay that was first implemented in Doom. I can't really comment on the actual choice as I joined shortly after LMS appeared as a Doom3 mod. Calimer: I think that modding is a great way to get experience, and I had no idea how to even begin a standalone game at the time, so it was the natural choice. Also I had wanted the experience to help me get a job working on an actual game, as opposed to starting my own business. Tell me a little about your experiences coding for the Doom3 engine: What's been the best thing about using the engine? 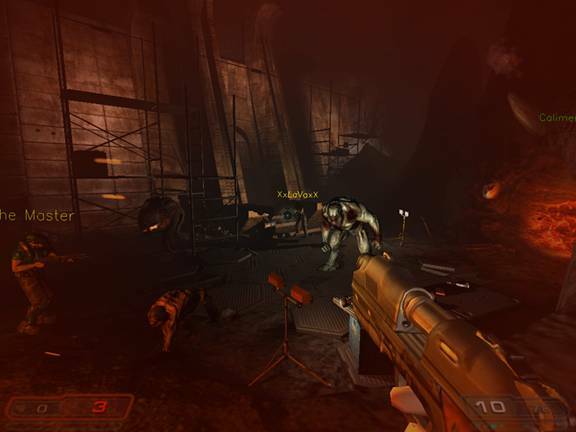 AO: Well it was a pretty daunting task getting to grips with the Doom 3 engine once the SDK was released. With over 250 000 total source lines and ~40 000 lines of C++ like script I felt pretty lost at the start. After about 6 months of working on the code it started to come together, and I could modify the code without having to look up and read the code so frequently to understand the concepts and program flow. Still I love the engine, it's a lean and mean engine created to fulfill it's goal to support a game like Doom 3. There's no leftover code because of a transition from any previous game, it's all written from 'scratch'. You still find concepts from the earlier Id engines in there which is probably why it's so fun working with the engine. MercyKiller: The engine has great support for advanced graphical features. I haven't actually done engine coding, but as a level designer the Doom3 engine is an excellent platform, regardless of what popular opinion seems to be. Calimer: I think the engine is well organized and I love how you can open just about any Doom 3 file in a text editor and see how it works and make changes. Also I like how map compiling times seem to be shorter than other engines I've worked with. Have you encountered any problems using it? AO: No, can't think of anything except the hours of frustration created by my own lack of understanding of the engine. Its part of the process needed to understand such complex code I think. MercyKiller: Doom3 is much more difficult to develop for than the previous generation of engines, and some designers decided to not use it because of this. One of the hardest things to get used to is the new approach to lighting. No longer can high framerates be maintained with a great number of overlapping visible lights, and one must compensate accordingly. 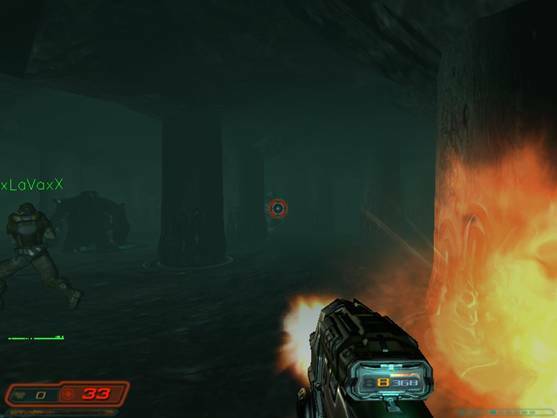 The stock Doom3 engine has no LoD algorithm or volumetric fogging which makes huge outdoor maps somewhat difficult. Thus, breaking levels into several sections is key, and visportals are a great tool for this. Calimer: I haven't done a lot of Doom 3 coding myself, but in regards to problems modding Doom 3, I would say that multiplayer definitely has a lot of problems. The netcode is not that good, and the game is very CPU and memory intensive. Also D3Radiant was buggy and resource intensive itself, and it also required Doom 3 to loaded while using it. A lot of care also had to be placed in the maps, and monster placement because of how easy it was to make an unplayable multiplayer map. MercyKiller: The above problems can be avoided through planning level layout within the constraints of the engine. Calimer: I don't think the netcode problem was really overcome, but a lot work was put into making it the best experience possible. We have come a long way in making it playable over the internet, which is really saying something. Also a lot of care in the level design is essential. My maps are very specifically tweaked to be intense but also run smoothly. Other mappers have done likewise, and maps that weren't up to par in terms of running smoothly were not included. Would you recommend other teams use the Doom3 engine to make their games? AO: Yes, I'd recommend it over any other engine. I like how Id software's engines are designed; they're relatively easy to understand after spending some time in the game code. Although I do not have much experience with any other game engines like HL2 or Battlefield 2. MercyKiller: I'd recommend that developers take a look at Doom3, and if the sort of game they're developing would work well with the engine's limitations than serious consideration of use would be a good thing. Naturally if you're a licensee then you can implement your own features. From what I understand Quake4 has some additional enhancements as well. Calimer: It largely depends on what their project goals are. It is important to take into consideration the strengths and weaknesses of all potential engines. The engine that is picked should best fit the needs of the actual project. How long has LMS been in development? How did you plan the development of the mod? (Tell me how you went from idea to the game as it is now). MercyKiller: From my perspective, development just sort of...happened. Everyone was motivated by the well defined concept and stuff just took off. Designers had total freedom within reason, and that's one of the reasons why we cranked out cool levels relatively quickly. Calimer most definitely knows more about the actual organization. Calimer: A lot of the mod is about collective development. There were certain jobs that were set that I wanted complete, but in general people were able to add what features they wanted. I think the beautiful thing about LMS is how it is structured in such a nonlinear fashion that as long as content obeyed some basic guidelines, imagination was really the limit as far as what could be put into the mod. Have you suffered any setbacks in your journey from zero to the IGF finals? MercyKiller: It was initially difficult to find a coder, and some of the weapon models took a while. However, development has never really stalled. BurN: Being in LMS since before its first release I'd say we have had our share of ''mod drama'; people leaving the team, real life situations where we had to take some breaks or just getting fed up with certain things. But overall calimer is such a wonderful team leader to have, and without a doubt it was with his enthusiasm that he kept us in constant motion. Calimer: There have been setbacks but a key way with how LMS was organized was that flow could be continued even if it was just myself on the team. I would say the most major setback was when the original project leader disappeared (I was originally the co-leader with a focus on mapping) and I had to make the choice of taking on all of his jobs in addition to mine, or to let the mod die. I think I made the right choice, even though it was only Burn and I for quite a while. I'm so glad that we never gave up, quitting was never even mentioned. I still have so much respect for Burn for never giving up hope or belief in me. I definitely couldn't of done it without him. Together with my map fortcomp, and then his gameplay video of the map, we were really able to get LMS steamrolling ahead. What advice would you offer other teams who want to make their own mods? AO: I wouldn't start a mod team unless I had the necessary level designers/coders/modelers/animators right from the start. Mods are dying because the amount of experience and dedication required. Lower the expectations of your own mod so you don't have to depend on anyone but the ones on the team you trust. Might be easier to get a team together in the Half Life 2 community, but it's only gonna get harder. Then on the other hand, it's even more impressive with those who do make a successful mod. MercyKiller: The most important thing is having a well defined concept and getting possible developers and players interested in the concept. Calimer had a stroke of genius when he released the demo version of Fortcomp. That was my first exposure to LMS and I remember thinking "Dude, this is everything Doom3 could have been if it were modeled after the first two games!" That mindset has propelled me forward throughout development. Calimer: The best advice I can give is start simple and work your way up! So many teams ignore this concept and fail because their projects are too ambitious. LMS is a great example of how even a concept seems simple can be a lot more work than one would realize. I structured LMS in such a way that I could do releases by myself if need be and every extra person working on it was an added bonus instead of a necessity. Would you recommend mod development over creating everything from scratch? AO: Definitely. Creating a mod lets you focus on the gameplay right from the start of development, which is really cool. It also gives you invaluable experience from working on the same code that the top game companies work on. MercyKiller : Mod development is probably a more viable alternative if you're just starting out, as you already have a base to work with. Traditional mods (total and partial conversions sometimes nonwithstanding) are generally also driven by a desire to make one of your favorite games better, whilst game development is more about implementing a vision. Calimer: It completely depends what your overall objective is. It does help have a base to work off of, but you are also limited in selling the product, the promotion you can give the product, etc. As a modding team, how do you feel the game development community supports your efforts? Is there any additional support that you'd like to see out there? AO: There's usually a few Wikis out there regarding the engine you're on, a few forums with lots of searchable information. I can only speak about Id software's latest engine here, but their support has been great, they really do more than you would expect. MercyKiller: I'd have been extremely great about supporting mod development with the Doom3 engine. Sure, the SDK was a little slow to come out and the 1.2 patch caused some problems, but things like IdDevnet and being able to communicate with the actual developers of the game is awesome. Doom3 modders are also very fortunate in that there are a great number of pioneering and inquisitive minds at Doom3World.org who are willing to share their knowledge. Calimer: Most of what I have learned is through playing with stuff myself and asking other members of the team, but the times when I was stuck Brian of Id Software was always very willing to help me out. So with that I'd have to say the support was great. As far as additional support it would be great to have more guys like Brian, especially that step up and make themselves readily available to modders. How have you gone about promoting your game? BurN : Promotion for the mod is a full time position for our main man calimer. He always submits news to countless gaming sites and pushes PR for LMS to its limits and beyond. We have also promoted LMS by releasing a few videos of LMS in action, which have all received great feedback. Calimer: Any way I could. I had even wanted to do TV commercials but I think I confused Id Software a bit when I proposed the idea. They initially got back to me but I think when they saw how serious I was about it I think they were unsure how to handle it. How well has your game been received by the wider community? Calimer: I think it has been incredibly well received. I have heard very little negative feedback about the mod, and so much positive. I think that finishing at #6 out of 3600+ mods in the user voted Moddb.com Mod Of The Year contest is a good indicator of how it has been received. How would you 'sell' your mod to people who have never played one before? MercyKiller: Nothing beats a live demonstration, in my opinion. BurN: Are we talking with our without the free chips and dip? Will you be attending the GDC 2006? AO: I will, all the way from Europe ! I consider it a once in a lifetime opportunity to be able to attend IGF as a finalist, and becoming a professional game programmer is my dream. So this is very exciting being able to attend GDC with all the conferences from industry veterans. MercyKiller : Yep. Look for a stereotypical looking teenaged bum with somewhat long hair. Calimer: Definitely! I can't wait to show everyone the mod and get them excited about it! Also I am so interested in meeting all the top-notch game developers and seeing what other game products people have to show off. It will be a learning experience of a lifetime. What opportunities do you hope that your place in the IGF finals will bring your team? AO: Will make it easier to get a game industry job hopefully! MercyKiller: I'm still relatively young so I'm not likely to apply for industry jobs anytime soon. The biggest thing for me is getting to attend the IGF and actually meeting veterans of the industry. BurN: I know that if we win the IGF competition that it would be if not the greatest day, one of the greatest days in this mod teams history. We will have infinite bragging rights, all the brownies we can eat, and it will be a wonderful way to show people Platinum Arts, the gaming company calimer has started (www.platinumarts.net). Calimer: I hope that it brings the mod more attention and that more people will as a result download it and enjoy it! The main reason the mod was created was to give people something fun to play, so the more people it can bring enjoyment to the better! Do you have any final thoughts or comments for our audience?